When you buy a business of your own . . . The restaurant industry ranks 4th in the nation, employing 2 million people. $20 billion is sent in the United States every year for food consumed outside the home. More than 60 million Americans spend over $50 million every 24 hours, for meals away from home. Drive-In restaurants, fastest growing segment of food industry, are springing up at the rate of a dozen a day. Approximately 4,000 drive-in restaurants were opened in 1962, representing a total investment of over $350 million. Increasing numbers of automobiles and a growing teen-age population assure an expanding market for food drive-ins. 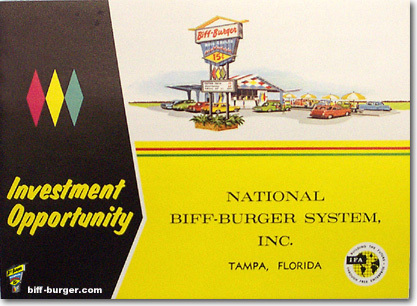 National Biff-Burger System, Inc., offers you . . .
Professional supervision in locating, leasing, landscaping and construction. Over 100 pieces of equipment. Sources of supply at chain discount prices. Free advertising and promotion materials. Over 9 years experience in the drive-in field. No previous restaurant experience necessary. A complete, ready-to-go, "turn-key" operation! What is National Biff-Burger System, Inc.? National Biff-Burger System, Inc., is a highly successful drive-in restaurant chain operating units from Toronto, Canada, to locations throughout Florida. The chain is a subsidiary of Mary Carter Paint Co., Tampa Florida, a AAA-1, publicly-held concern with total sales approximating $20 million annually. A long-time leader in the franchise field, Mary Carter is presently operating franchise businesses in 40 states, including Hawaii, and in Puerto Rico and the British West Indies. The company is affiliated with the International Franchise Association, and it is ranked among the outstanding growth firms in America today. (Over six-year period, from 1956 to 1962, the company's retail units increased from 46 to more than 800, and in the same period sales soared from $2.2 million to upwards of $20 million). As a result of long and successful franchising experience, National Biff-Burger System's parent company has developed full and complete facilities for establishing and servicing retail franchise operations of any kind. These include a real estate survey and procurement division, construction supervision staff, franchise operator training facilities, purchasing department, advertising and sales promotion departments, business administration and financing departments and a staff of experienced field service representatives. Your inspection of any National Biff-Burger System Drive-In is cordially invited, at any time. National Biff-Burger System's attractive Port-A-Unit building gives you a unique advantage over the operators of competitive food drive-ins. A specially designed and engineered package, prebuilt by the company in Florida for shipment to your locations, Port-A-Unit consists of a 10' x 40' porcelain covered steel basic unit, with wiring and plumbing ready for final hook-up; two restrooms, walk-in color and freezer, built-in refrigerator-freezer, ventilating, heating and air-conditioning systems; kitchen with three-compartment stainless steel sink, ice machine, broiler, heavy duty fryers, shake machines, drink dispensers, changemaker, etc. 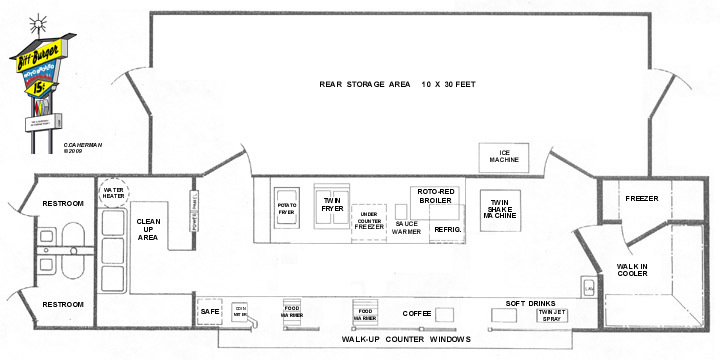 There is also a 10' x 30' storage room for storing supplies. Exterior of the building is of lifetime, ultraclean porcelain with vivid, attractive colors fired into the porcelain panels. The interior is of stainless steel, aluminum, formica, marlite and plastic, for easy cleaning and low maintenance costs. A 38' x 80' roof gives ample weather protection and visual appeal, as well; there is room for parking eight cars under the side canopies and a 14' overhang protects the serving area, which can be completely enclosed with screening. Port-A-Unit construction means you have a lower investment requirement with Biff-Burger System than with other comparable drive-in franchising organizations. The Port-A-Unit gets you into a business within six weeks, as compared with as much as six months waiting time in other food chain operations. The unit's portability obtains more favorable leasing terms from landowners, and you can move the entire building to another location if more favorable conditions develop elsewhere. Expensive construction costs are eliminated, and the unit's functional design speeds service and reduces labor costs. The Infra-Red heat utilized in the Roto-Red Broiler broils and toasts each sandwich exactly the same. Juices are retained by broiling uniformly from both sides at the same time. Better tasting sandwiches are produced at lower operating costs. Roto-Red R-22 will pay for itself in just a short time. Saves on meat, electricity and you can use inexperienced help, saving you labor. Less shrinkage allows use of smaller portions, yet servings are tastier and as large as before. Operators report 15% to 20% savings on meat costs. Buns placed on rack beneath patties catch the entire flavor of the sandwich. The bun rack is adjustable to toast buns as desired. Roto-Red can be used for toasting, warming or broiling steaks, hot dogs, rolls, donuts, pies, barbecues, pizzas, etc. Roto-Red can be taken apart for cleaning in just 15 seconds. Stainless steel construction assures long life and easy cleaning. Roto-Red is designed so you can adjust the speed with interchangeable gear pulleys. A simple pointer switch provides variable heat control. The operator can override the drive for sandwiches well done, rare, etc. There are no hidden gear boxes, complicated drives or thermostats to create maintenance problems. These Facilities Are Yours . . . The community in which you wish to establish your Biff-Burger Drive-In is thoroughly surveyed by company survey and location experts, who evaluate population figures, school enrollment, employment statistics, traffic counts, types of neighborhoods, competitive factors, projected business volume, growth picture, etc., before recommending a particular site. You will also have the assurance of an experienced company real estate specialist in negotiating with land owners. National Biff-Burger System's unique "Port-A-Unit" building is an invaluable asset in obtaining the most advantageous lease conditions on the best possible locations. All necessary permits and clearances for establishment of your Biff-Burger Drive-In are obtained for you by the franchising organization's expert in such matters. This includes building permits, electricity, plumbing, fire marshall, health department, highway department, etc. The company's representative will then make up specifications, have blue prints drawn, engage necessary local contractors, coordinate the arrival of building materials and supervise construction of the Port-A-Unit building, landscaping and lot improvements. No previous experience in the food or restaurant field is necessary to successfully operate a Biff-Burger Drive-In. All new franchise holders are given the benefit of a one-week training program at a company operated Biff-Burger unit, assuring that high quality standards of the chain will be maintained and enabling the operator to properly train and supervise his own employees. Cost of lodging and meals for the operator while taking part in the training program is borne by the franchising organization. During the period that your Biff-Burger Drive-In is in the development stage, our food operations specialists will be working closely with you in arranging for your most favorable sources of supply. As a member of National Biff-Burger System, you will receive the benefits of national contract purchasing, resulting in savings up to 3% to 4% of gross sales. The company's experienced food operations people will evaluate all food and materials needed for your operation and will contract vendors in the local area and help set up sources of supply. Chain-identifying paper goods and syrups are purveyed by the company, at competitive prices. National Biff-Burger System's advertising department will supply you with materials such as mats for newspaper advertising, scripts and recorded jingles for radio and television commercials, handbills, etc. The company's sales promotion department provides a grand opening advertising campaign introducing your new Biff-Burger Drive-In to the community. The Grand Opening Kit, valued at $175 and furnished without charge, consists of streamers, handbills, balloons and buttons for the youngsters and gifts for the adults. A regular program of seasonal sales and timely promotions is conducted by the company. In order to assure its operators of the best possible financing terms and conditions, National Biff-Burger System, Inc. has established a liberal financing program for franchise dealers. This allows you to develop a highly profitable business with a minimum investment. Operators are kept posted on new developments in the fast-changing drive-in field by company service representatives, who keep them advised as to new ideas and improved operating procedures. All members of the National Biff-Burger System receive periodic and frequent visits from the company's field men, who will assist with local problems and provide operators with profit-making suggestions and promotional campaigns. Exchange of informative ideas among Biff-Burger operators is encouraged. At National Biff-Burger System headquarters in Tampa, Florida, full and complete facilities are maintained for the administration of every phase of business activity. Our IBM 1401 Data Processing System equipment, and efficiently staffed advertising, marketing, franchising and production departments are available to serve you. Experts in all phases of retail food merchandising are available to offer assistance whenever an operator requires specialized business help. The heart of any successful drive-in is in its equipment and equipment location.Some of the latest labor saving, dependable pieces of equipment are used in the Biff-Burger System Drive-Ins. Most important is the specially designed Roto-Red Infra-Red Broiler. This unit broils both sides of the meat simultaneously, retaining the flavorful juices, reducing shrinkage to a minimum and at the same time toasting the buns. 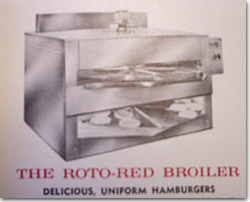 The capacity of the Roto-Red is over 500 uniformly broiled hamburgers and toasted buns per hour. It can be operated by inexperienced help and, because of the high quality capacity, food can be prepared to order for top quality control. An undercounter cooler is located below the Roto-Red for convenience of the broiler operator. Heavy-duty french fryers are built into the stainless steel counter. An undercounter freezer is located below and to the right of the fryers. The frozen foods to be deep fried are worked from this freezer. The twin head shake machine will produce over 500 smooth, creamy milk shakes per hour. Other than refilling with mix for approximately 150 shakes drawn, all the operator has to do is draw the shakes, add the straw and spoon, and serve. This equipment is placed so the operator can draw the shake, turn around and serve it to the customer without wasted footsteps, or mixing on a spindle. If business warrants one person drawling milk shakes exclusively, his motions do not conflict with the soft drinks also being dispensed from Window # 3. The drinks are drawn from electric-operated dispensing valves. Two ounces pressure of the cup actuates the valve single handed. It will supply cold drinks as fast as they can be handed out the window. Water and syrup are both precooled through the walk-in cooler before going to the ice cooler directly under the dispenser. Approximately 275 drinks of each flavor can be drawn before more syrup need be put into the stainless steel supply tanks. The Port-A-Unit building includes a built-in-freezer of over 80 cubic feet and a built-in cooler of over 350 cubic feet. All the equipment used is the finest available, including custom equipment designed for Biff-Burger's use. All equipment is pretested and evaluated for ample capacity, durability, ease of cleaning, and service. Serving large volumes of top quality food with less labor is possible with our equipment and system of serving. For customer enjoyment in a relaxing atmosphere, operators are urged to subscribe to the Muzak Recorded Music Service. National Biff-Burger System's tried and proven menu, of limited, low-cost items, makes previous experience in the food field unnecessary for a successful operation. Featured is the Biff-Burger, a large patty of 100% pure Western ground beef broiled in the Roto-Red Broiler, then dipped in a special, tangy sauce made of 27 spices. It is served on a bun toasted to a golden brown in the same infra-red broiler. Other items on the menu include a Cheese Burger, Twinburger (two large patties of meat in one bun), the Fish-Wich, a golden fried blue water fish fillet on a toasted bun; the Biff Dog, a pure, all-meat curled wiener; Tater Tots, French Fries, Thick Shakes, Floats and Soft Drinks. National Biff-Burger System, Inc., offers a drive-in franchise at a lower cash investment than is available from other comparable drive-in operations. Your cash requirement covers a planing and survey fee, down payment on the "Port-A-Unit" building and 30-foot Biff-Burger sign, and provides for operating capital, as well. The planning and survey fee is an initial expense to insure the successful location of your new business. The fee is refundable, less a reasonable deduction for National Biff-Burger's field expenses, in the event a satisfactory location cannot be obtained. The allowance for operating capital covers costs of lease deposit, legal fees, advertising, initial inventory, working capital, etc. Proper records are a necessity if you are to be able to gauge your progress from month to month. National Biff-Burger System will supply you with simplified forms designed to give you such a system at minimum cost. You may keep these records yourself, following the simplified instructions provided for each form. A few minutes each day is all that is needed to keep your records up to date, and by recording your own daily transactions you will enjoy a considerable savings in bookkeeping costs. The Daily Report form allows for easy product sales analysis. Other forms included a Monthly Summary of Daily Reports, Check Record, Weekly Payroll Report, Trial and Balance Sheet, etc. Q. Why is there such growth in the drive-in field? A. This field is growing tremendously and offers a fine opportunity for owning your own successful business. Increased travel on the highway, the expanding youth population and greater interest in fast, convenient food service all arecreating great growth for this industry. Over $20 billion will be spent on food outside of the home this year, it is estimated. Q. What is the Biff-Burger System? A. It is a proven plan for attaining a high volume, profitable operation with self-service Biff-burger Drive-in restaurants. The Biff-Burger System has been developed through extensive research and actual operation of many successful drive-ins over the past nine years. Through affiliation with National Biff-Burger System, Inc., the operator receives the benefits of a complete program covering every phase of the operation, insuring the success of every individual Biff-Burger Drive-In. Q. What is the "Port-A-Unit" building used in the Biff-Burger chain? A. This is a modern and attractively designed building, specially engineered for efficient, high-volume food service. The "Port-A-Unit" is pre-built and ready for shipment to the area of your choice. 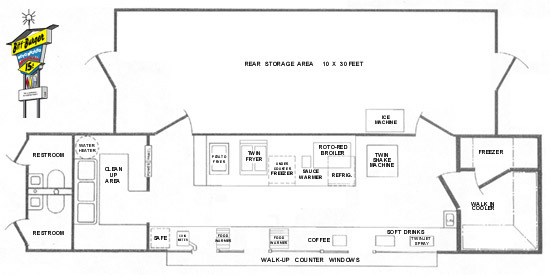 All of the equipment necessary to prepare and serve the food is included in the basic unit, which is a 10' x 40' porcelain covered steel building with complete wiring and plumbing ready for hook-up at location, two restrooms, built-in walk-in cooler and freezer, ventilating and air conditioning systems, gas heating, kitchen with three-compartment, stainless steel sink; preparation and serving area with ice machine, broiler, fryers, refrigerator-freezer, shake machine, drink dispensers, changemaker, etc. All the equipment used in preparing and serving the Biff-Burger menu is manufactured by firms nationally prominent in their respective fields, and is included in the basic unit. The exterior is of lifetime, ultra-clean porcelain with the color fired into the porcelain raised diamond shaped panels. The interior is of stainless steel, aluminum, formica, marlite and plastic for ease of cleaning and low maintenance costs. A 10' x 30' storage room for storing all extra supplies is connected to the basic unit. This is constructed of baked enamel aluminum insulated panels. The 38' x 80' roof over the basic building gives weather protection and eye catching appeal to the Biff-Burger Drive-In. Room is available for parking eight cars under the side canopies, plus a 14' overhang protecting the serving area, which can be enclosed for Winter operations, giving Biff-Burger all the features desired in a self-service drive-in plus the most valuable feature, mobility. The whole package can be moved, as it is delivered and set up in sections. Q. How much money can be made as an owner-operator? A. Your profit will be controlled by the amount of volume done. The operating statement shown depicts earnings of over $45,000 on an individual unit, based on actual experience. The Port-A-Unit building is set up to handle $250,000 potential volume, and good, established units gross from $150,000 to $200,000, with approximately 20% net return. Q. How much rent will I have to pay? A. Actual land lease costs will be determined by real estate values in a particular area, but generally approximately $300 monthly rental. Our experienced real estate specialists negotiate the best possible lease for the operator. We will not select a location site where the rent will be too high for the business potential available to the lessee. Q. Does my cash investment include payment of a franchise fee? A. No. Unlike other food drive-in chains which require franchise fees up to $10,000, National Biff-Burger System has no such requirement. Q. Is a royalty fee paid? A. Yes. The complete package of a Biff-Burger "Port-A-Unit" is sold as low priced as possible to cover actual costs. Funds to pay for the assistance of service personnel and warehouse of emergency supplies, forms, equipment, parts, etc., and for the National Biff-Burger System home office administration, legal services, bookkeeping, supply ordering, warehousing, advertising, etc., are derived from a 2% of the gross sales paid to the Biff-Burger System. 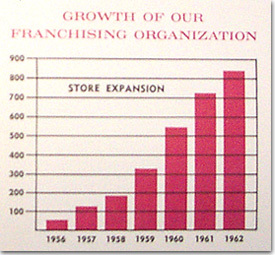 The entire organization can be no more successful than the continued success of individual drive-ins. Therefore, it is to be the best interest of all that the Biff-Burger Drive-In operator be as successful as possible. Q. What do I receive for the royalty fee? You get exclusive rights to operate a Biff-Burger Drive-In for the area of your franchise, protected by written contract. Experienced personnel will survey the desired area and assist in finding a location and negotiating a favorable lease. A Biff-Burger representative will supervise installation of the "Port-A-Unit" building, equipment and signs. Complete management training for owners or manager at company training centers. Representative at your drive-in during the Grand Opening period, to help train employees, etc. The price advantages and reliability of continued sources realized through large volume contracts. Most items drop shipped, prepaid freight, direct from the source of supply. Special recipes and formulae, as required. Quality control by Biff-Burger to insure the same high quality in each unit. Benefits of national Biff-Burger advertising, plus newspaper display advertising mats, radio and television scripts and other promotional material for local advertising. Optional participation in National Biff-Burger System's group insurance plan. A field operations supervisor is available for assistance with any problems that may arise. Q. Where are my supplies purchased? A. Printed cups, bags and straws, syrups and several other items are drop shipped, prepaid freight, from the manufacturers, who are under contract to Biff-Burger System to produce and stock these items for immediate shipment to individual drive-ins. Other items, such as milk shake mix, potatoes, buns, etc. are contracted for in each area. These sources must supply foods that meet quality standards of the Biff-Burger System. Q. Does this buying through the national chain's contacts save me any money? A. Yes. Not only does this volume buying arrangement save you money, but the printed materials identify your store with the national franchised chain. This creates customer confidence and also develops repeat business throughout the chain. Q. What happens to my reputation as a Biff-Burger affiliate, if other drive-ins of the chain serve inferior food or give poor service? A. Every Biff-Burger operator agrees to keep quality and service up the Biff-Burger standards. Periodic visits are made by the area service representative, and any irregularity is reported to the operator and a copy is forwarded to National Headquarters. If corrections are not made within a reasonable time, the operator risks loss of his Biff-Burger franchise and use of the name on signs, advertising, etc. Q. Why is the Biff-Burger System more practical than most other systems? A. For less than the cost of equipment of some franchise operations, the Biff-Burger System includes the "Port-A-Unit" building with car canopy for eight cars, equipment, signs, compressors, tables, planters, small utensils, office equipment -in fact, everything needed to operate the drive-in smoothly. The building and canopy is designed so that it is practical to operate in a location on a short-term lease, and if highway traffic, undue competition or other unforeseen economic reasons make the locations less desirable, the complete unit can be moved to a new location or area where the potential is greater. This advantage of portability makes available excellent locations that might be unobtainable if a building were to be constructed on a permanent basis, for long lease. Q. Does Biff-Burger restrict the menu, or can I serve anything in my drive-in? 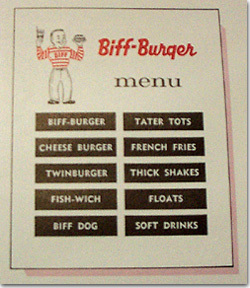 A. Biff-Burger has a more complete menu than most similar operations. It can be understood why individual drive-ins must have written permission to add any item to the menu. However, certain areas will serve some items not practical in others. Many items will be completely uniform for each area, and nationally uniform on the majority of items. Q. Why does some drive-ins of this type have to keep so many employees on duty during slow periods? Does Biff-Burger also have to have a large number of employees? A. Biff-Burger's equipment, floor plan, and system of serving the customer is such that when business is slow, as in any business during certain times of the day, each employee can take care of more than one station. Example: the cashier may take the order and put the french fries on. The broiler girl may put on the sandwiches, draw the drinks and serve the customer. During a slow period, two persons can operate the entire drive-in. Q. Does this advantage actually save money? A. Yes, its certainly does. Any system of any consequence can operate at a fairly reasonable payroll percentage compared to sales during peak rush periods. However, if the labor curve doesn't follow closely the volume of business curve, the labor cost can eat up the profits realized from food sales on all but the busiest times of the day. Q. Do I have to rely on grill cooks or specialized help in my drive-in? A. Absolutely not. Any good employee can do any work at any of the stations after four or five days' training. Our specially designed infra-red broiler, as well as the other equipment, can be operated by any inexperienced help. Q. Does this save operating costs? A. Not only does this save on the rate of pay for chefs or grill personnel, it allows the manager more flexibility in case of sickness, vacations, etc. Q. With whom do I deal in securing a Biff-Burger franchise? A. Write or phone: National Biff-Burger System, Inc., Franchise Department, P.O. Box 406, Tampa 1, Florida, Telephone 935-8411. * Please note that the National Biff-Burger System, Inc. is no longer in business and franchise opportunities are NOT AVAILABLE!! This information is for historical and archival purposes only! Please DO NOT use the contact information above. ** Source: A special thank you to Eric Bowyer, Sarasota, FL, for making this franchise brochure known and to his gracious donation to the Biff-Burger Museum, a private collection. An acknowledgment of appreciation is also given to the late great Billy Sullivan Jr. (1910-1994), Famous Chicago White Sox Baseball Player (1931-1933), the previous and original owner of the booklet titled, "National Biff-Burger Systems, Inc. Investment Opportunity", from which the above information and images were taken directly from.